This issue opens with Iron Man being reprimanded for having deliberately ignored an Avengers call for aid, something that happened in the last issue of his own magazine. Marvel really are doing a decent job building the idea of one large, interconnected story that takes place over the course of all their different superhero comics, and are subtly encouraging readers to pick them all up if they want the whole picture! (That said, Stan's still careful to explain the salient details for those who might have missed it.) In The Fantastic Four #1, Stan introduced the idea of a superteam that did not get along all the time - unlike, say, the Justice League of America, over at DC - and in the pages of The Avengers, he's continued that tradition: first, by having one of the founding members quit at the end of their second issue, and now again by showing that heroes will be called on the carpet and duly disciplined when they happen to screw up. Even with the villains, Stan will write in a love triangle! The Masters of Evil were introduced last month - and yes, that's "month", as the comic has now gone monthly! - and yet they're already back, albeit in a different form. (It's worth noting that the MOE name is never applied to the three in this issue; however, given the membership that the villainous team will soon take, it's clear that this is an indisputable link in that chain.) And if this seems a familiar move, that's because it's similar to what's been happening in the pages of The X-Men, where the Brotherhood of Evil Mutants debuted in issue #4, and have thus far reappeared in every issue since. Clearly, Stan and Jack know when they've happened upon a concept with a lot of potential in it, and this "team of baddies" idea is it! But here they're already tinkering with the lineup of the group, even in its second appearance - as the leader, Zemo, is the only one to return! 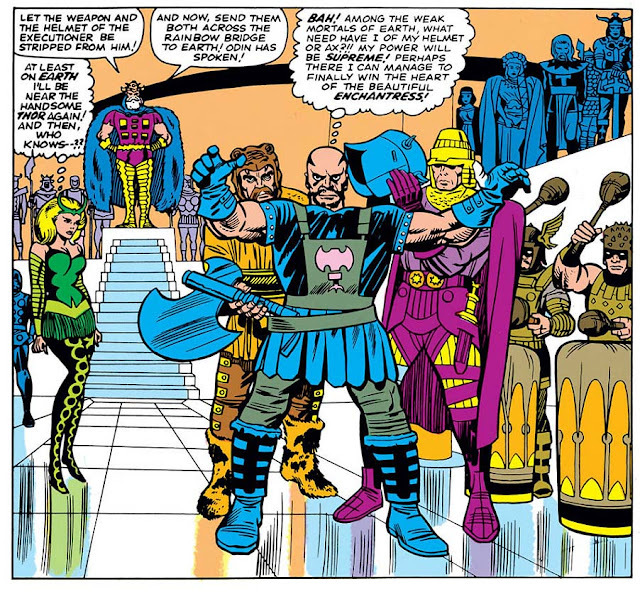 But that's okay - he's joined by Thor villains the Enchantress and the Executioner, freshly banished from fabled Asgard by All-Father Odin. Gotta love those kooky villain masks! These days, we'd call that a case of PTSD. Having been soundly defeated by the assembled Avengers before, the MOE's tack this time is seemingly to pick the heroes off, one by one. 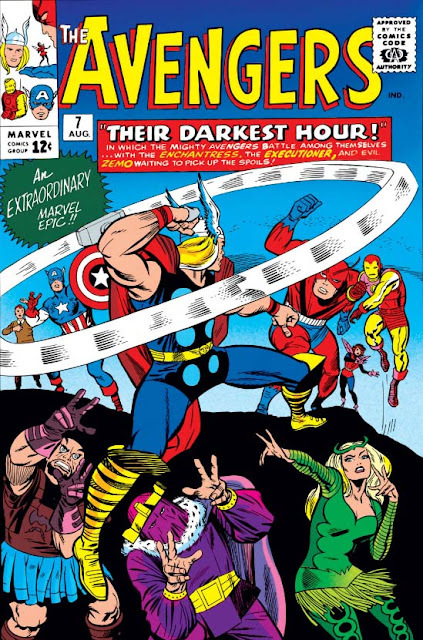 With Iron Man suspended, they wait till Giant-Man and the Wasp head off to New England for some scientific insect research, and then lure Cap to South America, so that the Enchantress can use a magic potion to brainwash Thor into perceiving his fellow teammates as evil demons whom he must surely destroy. It's a devious plan, and one which makes for an exciting adventure - marred, unfortunately, by the hurry and nonsense with which the tale is suddenly wrapped up. For instance, the baddies are making their getaway ... and yet they stop to throw the unconscious Captain America off their ship, rather than (say) take him with them as their prisoner. 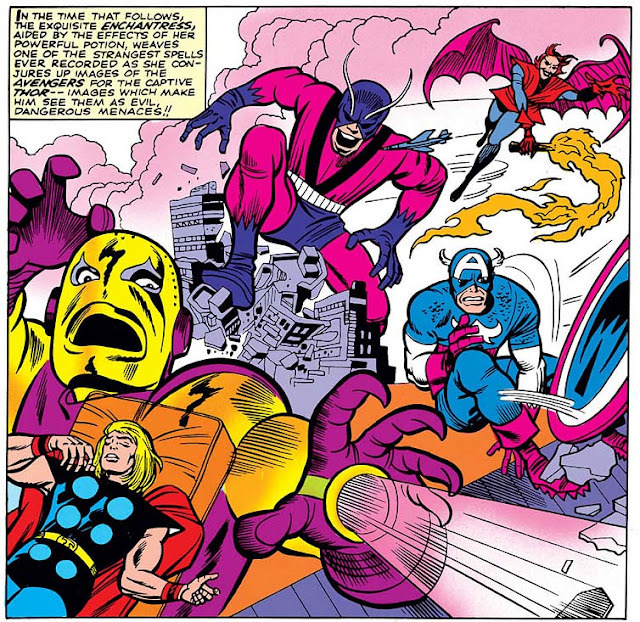 And then, as if Stan and Jack felt the need to give the Avengers some sort of victory, we see Thor whirl his hammer round to whip up a space warp (!!) into their path, whisking the villains away to ... oh, I dunno, somewhere. Of course, they won't be gone for very long...! Wow! I'll bet that image gave more than a few kids nightmares for a week.